sunshine and whimsy. 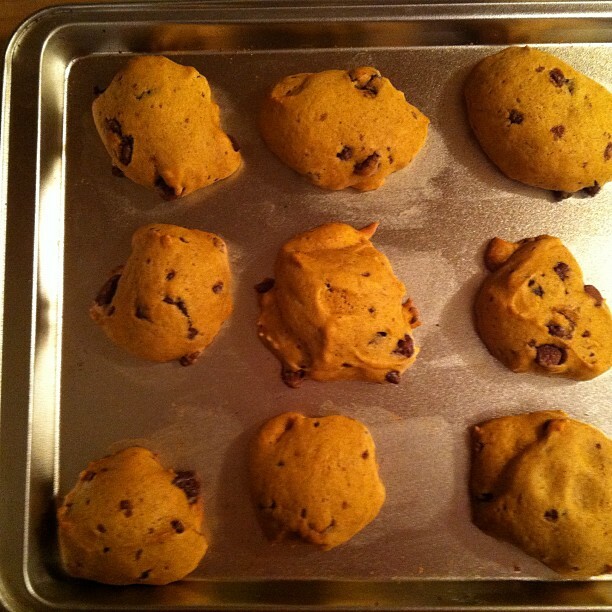 : nan's pumpkin chocolate chip cookies. nan's pumpkin chocolate chip cookies. Pumpkin chocolate chip cookies are one of my favourite kinds of cookies. When I called Nan to tell her I'd definitely be coming home for Thanksgiving, I asked her if we could bake some. After all, it's autumn, and what is more autumn-y than pumpkin? Add chocolate chips and bam!, you have the perfect autumn treat! Preheat oven to 375°F. Sift flour, cinnamon, salt, baking soda, and baking powder into a bowl and set aside. In a mixing bowl, beat sugar, pumpkin, and oil together. Add eggs, milk, and vanilla; mix together. 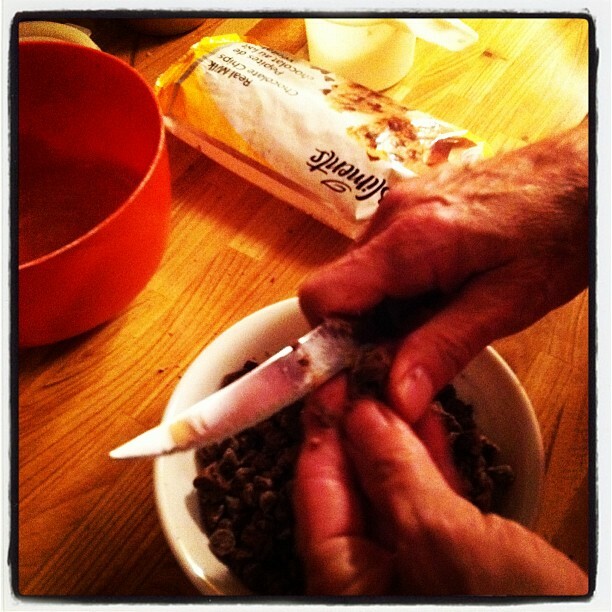 Add the dry ingredients that you've sifted and stir until well-mixed. Finally, add the chocolate chips and stir until they're evenly dispersed. Drop dough by spoonfuls onto cookie sheets. Bake for 10-15 minutes. Let them cool on the sheet for a minute or two and then transfer to cooling rack. Makes approximately 5 dozen cookies. Edited to add: They taste even better on the second day! P.S. We baked these the day we had our Thanksgiving dinner. And the package of chocolate chips was left beside the slow cooker that our ham was in. Nan rescued them but it was a bit too late; some of them had melted together. 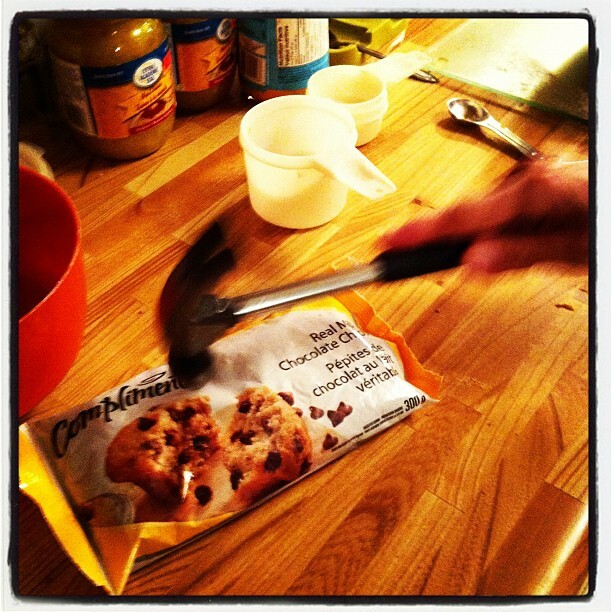 She tried breaking them up with her hands but when that didn't work, she got out the hammer (at my suggestion). When the hammer didn't work, she got out a knife. We're nothing if not resourceful. We laughed and laughed. And then laughed some more. Then, when the first sheet was in the oven, my Nan peeked at the cookies, burst out laughing again, and exclaimed, "You're your grandmother's granddaughter!" Slightly confused, I asked, "Why?" "Because you can't make a round cookie either!" pumpkin choc. chip is my fave! i must make these! They're not very healthy but they're VERY delicious!